Working with plants was my first passion, not the leafy, typical household varieties, but those of a thorny nature. Yes, Cactus Plants! This began as a hobby but when I took over all the windowsills in the house, there was no where else to go. That's when I asked my Father to design a greenhouse for me out of old glass storm windows. Putting this together was a simple task for him, as he was an accomplished carpenter. At last, a small, glass house was structured to store my 20+ plants. It enabled me to collect over 150 varieties including cacti, bromelaids, and succulents of the strangest nature. Throughout school, other interests took over. This is when I started looking at flowers in the garden, gardening with the help of my wonderful Aunt Julia, who was an avid gardener. She was my mentor and introduced me to the wonderful world of planting and maintaining a garden. Roses of every variety, annuals, perennials and just about anything that you can start with a cutting. When I think back and look at trees, a smile somes to my face as I remember a fruit tree that I planted. Then, there was a seedling from a mimosa tree, which I nurtured as it grew in my parents' yard for more than 20 years until its lifespan ended from old age. This, I thought, was a wonderful achievement. Gardening and the knowledge of plants and flowers was my passion; however, my career still wasn't set in motion. One day, while reading a magazine, I came across an ad on "Learning Flower Arranging at Home". That's when the light bulb clicked! I began researching careers in the industry. My first start, in those days, was the local library where I read every book and article on the topic. Then, with the aid of guidance counselors from high school, the floral design schools appeared. Before design schools, I was an apprentice learning basic techniques from local floral shops. In order to further develop my design potential, the quest for the right Design School began. Where? When? How much? How long? All these questions at the young age of 17. I was ahead of my time. Growing up in the small town of Manville, NJ and never living elsewhere, did I want a city or a small town area? Well, I chose the city. What city? The Rittner School of Floral Design in Boston had a very high reputation. So, I registered and was ready to go to the big city of Boston. . .oh joy! The experience was priceless not to mention frightening as I knew no one there. Having the basic concepts in my mind's eye, I was ready to take on the world of creative floral design! I took the advanced class and the creativity was released. I didn't think I had the ability to create some of the arrangements that were taught. I learned that creativity is something we all have within us. It's how we choose to express and release it through form, shape and style. Off I went - exploring new avenues and plant materials that I have only seen in books. Let the fun begin!!!! 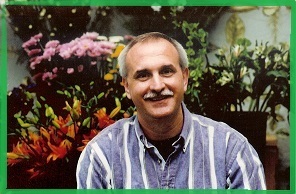 Today, Sonny (Frank Gada) has been a floral designer for more than 30 years. He is an award-winning floral designer who lives in Chatham, MA, a charming town on Cape Cod. For several years, Sonny has been invited to participate in the Boston Museum of Fine Arts yearly event, "Art in Bloom" where his floral arrangements have been featured. A teacher and lecturer, Sonny brings a unique approach to floral arranging, focusing on natural objects and found treasures to create exciting and novel floral pieces. He approaches floral arranging as an art, and all nature becomes his palette. The star of his own access TV show on Cape Cod Community Media, Channel 17, Sonny has presented shows on Shakespeare's Flowers, Pitcher This, Wreaths, Shells and seasonal arrangements on his well received half-hour show, Sonny's Floral Trends.